Waiting for Vanderbilt’s 2017 Outstanding Senior outside his 11:00 class, I could not resist letting out a couple audible laughs. I recalled the first time we met, as he jumped over the couch across from me in the commons center and excitedly said, “Hi, I’m Sam.” A couple days after meeting, we went to Chipotle in Halloween costumes for half off burritos and he showed off his stellar dance moves while we waited in line. Now, four years later, Sam Edwards emerges from his class and puts me in a loose headlock right away. The same Sam as always. While he thinks the Outstanding Senior title is just a label, Sam still hopes it will inspire students who come from similar backgrounds, saying, “I’m going to learn more to become the best version of myself and I’m going to do that in a way that I can go back at some point and tell all those other people that are just like me, ‘Hey, come on, we can do this.’” Sam passionately acts as a role model for first year students and hopes to convey this message to them. Despite his own surprise, many people around campus had a gut feeling that Sam would win the award. 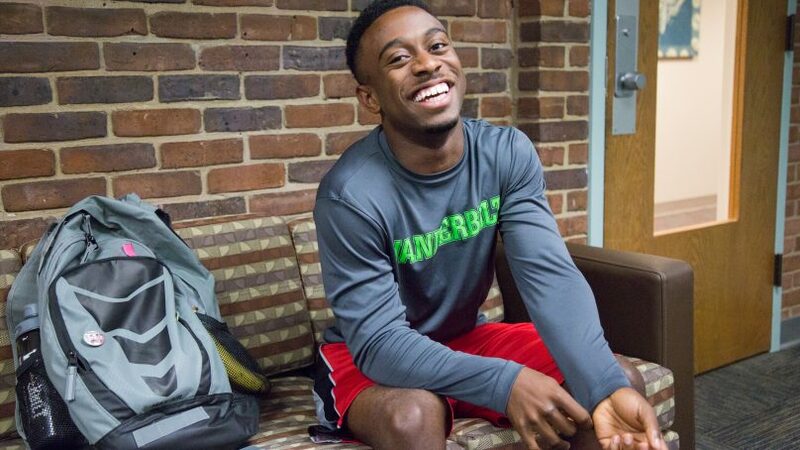 Sam has meaningfully impacted student lives for four years now, through his roles as a VUceptor, tour guide, resident advisor, service leader, and friend. Part of what makes Sam so truly outstanding is the priority he places on people, explaining, “In my opinion everyone is worthy of my attention and my time and if I can positively impact their lives in some sort of way, I’ll do it. That’s what I’m here for.” He has been there, time and time again, for struggling students and strangers. Perhaps Sam’s most outstanding talent is making people feel loved and worthwhile. Humbled by his election, Sam shakes his head while saying, “I’m still going to be that same kid that procrastinates everything, that goes to all the sporting events, says hi to people in Rand, and eats really slowly. That’s still going to go on, it will just be nice to go home on Thursday and say ‘Hey mom, you didn’t raise a scrub. People like me, don’t they? I’ve done something pretty good.’” While his academic and extracurricular accomplishments are surely impressive, it is Sam’s bubbly personality and devotion to others that won him Vanderbilt’s Most Outstanding Senior, showing a community entrenched in competition and academic stress the importance of personal relationships. This year, Vanderbilt voted, and Sam’s enthusiastic personality is what stood out as most outstanding and spectacular within the senior class. Whether he is leading a service trip, a tour, or a visions session, Sam will always be ready to take a costumed dance break in Chipotle. On my close friend’s blogs they have actually included me on their blog rolls, but my own constantly sits at the bottom of the list and does not checklist when I publish like it does for others. Is this a setting that I need to alter or is this a selection that they have made?. What are some great sites and also blog sites for inexpensive fashion for grownups? I just want to mention I am beginner to blogging and site-building and definitely liked you’re website. Very likely I’m planning to bookmark your site . You surely come with fabulous stories. Many thanks for sharing your web page. Cosmetics ‘ve got never ended up being as effective as the following is at this instant. Health headset microphones but take a helpful terrible key amount of abuse.